Hitchcock On Hitchcock: Selected Writings & Interviews Volume II has been published twenty years after the first volume of Hitchcock On Hitchcock appeared in 1995. Like the first volume, it's an anthology of interviews and articles written by Hitchcock (or "articles with his byline", as authorship of publicity material is hard to verify). Editor and Hitchcock scholar Sidney Gottlieb wrote one of the best essays in 39 Steps To The Genius Of Hitchcock. The texts have been transcribed from newspaper and magazine articles published between 1919 and 1978. Highlights include two newly translated interviews by Francois Truffaut from Cahiers Du Cinema, and A Lesson In Psycho-logy, in which Hitchcock explains Psycho's marketing campaign. There are also a few previously unpublished pieces, including an extensive transcript of a conversation between Hitchcock and Stage Fright's production supervisor Fred Ahern. 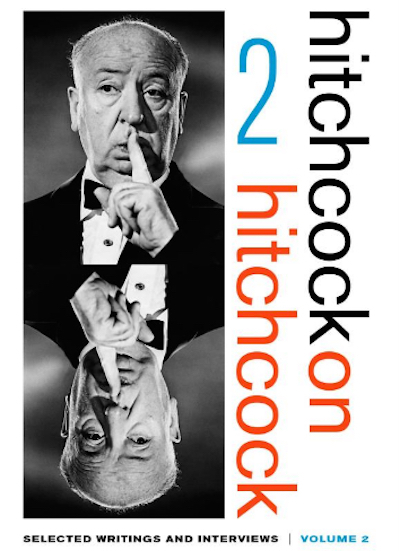 Hitchcock has been written about more than perhaps any other director. Paul Duncan's Hitchcock: Architect Of Anxiety is an illustrated summary of Hitchcock's career. François Truffaut's book-length interview Hitchcock, and Donald Spoto's filmography The Art Of Alfred Hitchcock, are both essential reading. There are shorter Hitchcock interviews in Who The Devil Made It (Peter Bogdanovich) and The Men Who Made The Movies (Richard Schickel). Bill Krohn wrote the concise Masters Of Cinema: Alfred Hitchcock and the excellent Hitchcock At Work. Spoto's The Dark Side Of Genius is the standard Hitchcock biography, and John Russell Taylor wrote Hitch, an authorised biography. Laurent Bouzereau's Hitchcock: Piece By Piece and Dan Auiler's Hitchcock's Notebooks both contain material from the Hitchcock archives.